Oh, and then there's the army of undead just over the hill looking to gnaw on our soul! * An introduction to roleplaying and the Army of Darkness story. * A guide to character creation, including ready-to-play champions and companions, as well as specs on the Army of Darkness cast, for your quick-play pleasure. * The Army of Darkness Unisystem, streamlined for cinematic action and adventure. * Guidleines for bringing the little people together, training them, and pitting them against the forces of evil. 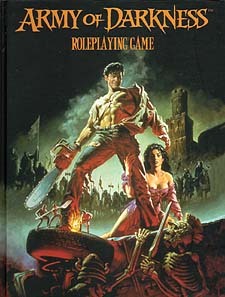 * Blow-by-blow instructions for creating Army of Darkness roleplaying game sessions. * A rundown on the Army of Darkness setting, places, people, events, including details on evil clones, demons, undead, and other critters. * Fleshed-out new setting suggestions, taking your Army of Darkness game in freshly gruesome directions. * A complete adventure to get the horror and hilarity under way right away.